Murine CMV (MCMV) encodes three viral genes that interfere with Ag presentation (VIPRs) to CD8 T cells, m04, m06, and m152. Because the functional impact of these genes during normal infection of C57BL/6 mice is surprisingly modest, we wanted to determine whether the VIPRs are equally effective against the entire spectrum of H-2b-restricted CD8 T cell epitopes. We also wanted to understand how the VIPRs interact at a functional level. To address these questions, we used a panel of MCMV mutants lacking each VIPR in all possible combinations, and CTL specific for 15 H-2b-restricted MCMV epitopes. Only expression of all three MCMV VIPRs completely inhibited killing by CTL specific for all 15 epitopes, but removal of any one VIPR enabled lysis by at least some CTL. The dominant interaction between the VIPRs was cooperation: m06 increased the inhibition of lysis achieved by either m152 or m04. However, for 1 of 15 epitopes m04 functionally antagonized m152. There was little differential impact of any of the VIPRs on Kb vs Db, but a surprising degree of differential impact of the three VIPRs for different epitopes. These epitope-specific differences did not correlate with functional avidity, or with timing of VIPR expression in relation to Ag expression in the virus replication cycle. Although questions remain about the molecular mechanism and in vivo role of these genes, we conclude that the coordinated function of MCMV’s three VIPRs results in a powerful inhibition of lysis of infected cells by CD8 T cells. Cytomegaloviruses are ubiquitous species-specific viruses that persist within a host for its entire life. CMVs encode a group of proteins called VIPRs (viral genes that inhibit Ag presentation to CD8+ T cells) (1). Even though all CMVs encode VIPRs, the VIPRs found in each species have developed specialized mechanisms to interfere with the MHC class I pathway of their particular host. Murine CMV (MCMV)3 has three VIPRs, m04, m06, and m152, which encode the glycoproteins m04/gp34, m06/gp48, and m152/gp40. All three VIPRs function to inhibit CD8 T cell recognition of infected cells, but each VIPR employs a unique strategy to accomplish this task. m152 primarily functions by blocking MHC class I transport from the endoplasmic reticulum (ER)-Golgi intermediate compartment (ERGIC) to the Golgi, resulting in an accumulation of peptide-loaded class I molecules in the ERGIC and a reduction in cell surface class I expression (2, 3, 4). Interestingly, although m152 has a pronounced effect on MHC class I transport, no direct biochemical interaction between m152/gp40 and MHC class I has ever been demonstrated. In contrast, m06/gp48 forms a tight association with MHC class I molecules in the ER. A dileucine motif in the cytoplasmic tail of m06/gp48 targets the MHC class I-m06/gp48 complex to a lysosomal compartment, where both proteins undergo rapid proteolysis (5), causing a dramatic reduction in cell surface MHC class I expression (6, 7). MCMV’s third VIPR, m04/gp34, is primarily ER resident. A small portion of m04/gp34 forms a stable association with MHC class I molecules in the ER (8, 9). These complexes are exported to the cell surface, where they remain for several hours. However, the exact mechanism by which m04/gp34 inhibits CD8 T cell recognition remains to be determined. The fact that multiple VIPRs are encoded by both human CMV (HCMV) and MCMV is intriguing, and the advantage to the virus of this multiplicity is still not clear. For MCMV, the possibility that these genes were redundant was soon excluded: removing any one of MCMV’s three VIPRs enabled recognition of infected cells by at least some CTL clones (10, 11). Evidence has been obtained for cooperativity, i.e., that the combined actions of two or more VIPRs more efficiently inhibited Ag presentation than any VIPR acting alone (10). There is also evidence that different VIPRs may play a greater role in some cell types than others. For example, we observed that m04 appeared to play a more prominent role in macrophages than in fibroblasts (11). We also suggested that MCMV’s VIPRs acted in complementary fashion, with efficient action of one VIPR against some MHC class I isoforms being complemented by a more efficient action of another VIPR against other isoforms (10). Metabolic labeling and pulse chase analysis revealed that m152 inhibited the transport of H-2Db more efficiently than H-2Kb. Although m04/gp34 coprecipitated with both Kb and Db, we observed that three Kb-restricted MCMV-specific CTL clones could lyse cells infected with a MCMV lacking m04 (Δm04), whereas two Db-restricted clones could not. We thus suggested that a contribution from m04 was required to completely inhibit Kb-restricted Ag presentation, because of m152’s relatively weak activity against Kb. In contrast, because Db transport was much more efficiently inhibited by m152, we suggested that a contribution from m04 was not necessary to inhibit Db-restricted Ag presentation. A more detailed study of the interaction of MCMV’s VIPRs was made possible when Wagner et al. (6) used bacterial artificial chromosome (BAC) technology to create a panel of seven MCMV mutants that expressed all possible combinations of MCMV’s three known VIPRs. These mutants were used to examine the impact of the VIPRs on total cell surface MHC class I expression levels by FACS analysis of infected transformed fibroblasts. These experiments revealed that cells infected with a virus lacking all three VIPRs (Δm04+m06+m152) expressed equivalent cell surface MHC class I to uninfected cells, indicating that MCMV contains no other genes that can down-regulate cell surface class I. These experiments also demonstrated preferential action of the individual VIPRs against different class I isoforms: for example, they confirmed that m152 affected Db more strongly than Kb, and m06 caused greater down-regulation of the K locus alleles (Kb and Kd) than did m152. Cooperativity was also observed between m152 and m06, with their combined impact being greater than the impact of either alone. A fascinating result of that study was that m04 could antagonize the impact of m152, a feature that was observed only in mutants that did not express m06. The authors suggested that MHC class I is initially retained in the ER by m152/gp40, but that thereafter m06/gp48 and m04/gp34 compete for the MHC class I molecules. They postulated that when all three VIPRs are present, m06/gp48 generally wins this competition, escorting class I to lysosomes for destruction. However, if m06 is absent, m04 can rescue some class I from m152-mediated retention, escorting it to the cell surface and leading to an overall greater cell surface level of class I. Measuring the impact of the VIPRs on total cell surface class I is a fairly crude surrogate for assessing their impact on Ag presentation. An activated CTL requires only ∼10 MHC-peptide complexes to exert effector functions (12). The VIPRs cannot completely suppress cell surface class I expression in fibroblasts, and, in fact, 30–50% of total class I is still present on the cell surface during infection (6, 9). The following question arises: how well does this level of cell surface class I reduction correlate with inhibition of CTL function? Previous functional studies of the impact of MCMV’s VIPRs have been conducted with CTL clones specific for a limited number of epitopes. For example, the conclusion that m04 would be required to inhibit Kb- but not Db-restricted Ag presentation was based on data from three Kb-restricted and two Db-restricted clones. Our recent identification of the Ags recognized by these clones (13) revealed that, whereas the three Kb-restricted clones recognized three different Ags, both Db-restricted clones were specific for the same epitope from M45. We have now identified 16 Kb-restricted and 10 Db-restricted CD8 T cell epitopes. It therefore seemed timely to revisit the questions and hypotheses concerning the interplay between MCMV’s VIPRS. IC-21, a SV40-transformed macrophage cell line from C57BL/6 mice (14) (a gift from A. Campbell, Eastern Virginia Medical School, Norfolk, VA) were cultured in RPMI 1640 supplemented with 10% FBS, 2 mM l-glutamine, 10 mM HEPES, 1 mM sodium pyruvate, 4.5 g/L glucose, and 1.5 g/L sodium bicarbonate and antibiotics. BALB/c 3T3 (American Type Culture Collection; ATCC), L929 (ATCC), K41, and K42 (SV-40-transformed H-2b fibroblasts (a gift from M. Michalak, University of Alberta, Edmonton, Alberta, Canada)), and B16-FL (15) (a gift from G. Dranoff, Harvard Medical School, Boston MA) were cultured in DMEM supplemented with 10% FBS and antibiotics. L929 supernatant, a source of macrophage CSF, was harvested from L929 cells grown for 10 days after reaching confluence. Primary bone marrow macrophages (BMMΦ) were isolated by the procedure described by Bouwer et al. (16). Briefly, bone marrow was cultured on nontissue culture-treated petri dishes in DMEM supplemented with 10% FBS, 30% macrophage CSF from L929 supernatant, and antibiotics. Six to 10 days later, adherent cells were isolated by incubation for 30 min in cold PBS. Wild-type (wt) BAC-derived MCMV strain MW97.01 (17), Δm04, Δm06, Δm152 Δm04+m06, Δm04+m152, Δm06+m152, and Δm04+m06+m152 (6) were grown on C57BL/6 mouse embryo fibroblasts, then purified by pelleting over a 15% sucrose cushion (18). Each virus stock was titered without centrifugal enhancement on BALB-3T3 cells. The mean of three virus titrations was used to calculate titers for use in these assays. Female C57BL/6 (B6) mice were purchased from the National Cancer Institute-Fredrick or The Jackson Laboratory and infected with either 1 × 106 or 5 × 106 PFU of MCMV. Spleens were harvested from mice that had been infected at least 11 wk previously. As a source of DC-enriched splenocytes to stimulate CTL lines, we used spleens from mice that had been infected 14 days previously with the Flt-3 ligand-secreting tumor, B16FL. Splenocytes from B16FL-injected mice were gamma-irradiated and pulsed with peptide at 10−8 M, and cultured with splenocytes from MCMV-infected mice in RPMI 1640 supplemented with 10% FBS for 3 days, after which 10 U/ml rIL-2 (eBioscience) was added. After 10 days, the percentage of CD8 T cells responding to the simulating peptide epitopes was assessed by intracellular cytokine staining, and the cells were used in 51Cr release assays. Anti-gB and anti-gH were a gift from L. Loh (University of Saskatchewan, Saskatoon, Saskatchewan, Canada) (19, 20, 21). Anti-Kb (Y3) and anti-Db (B22-249) (ATCC) and anti-pp89 (22) were purified on protein A, G (Sigma/Aldrich) columns and conjugated to FITC (Molecular Probes), PE, or allophycocyanin (Cyanotech) according to published protocols (23). Anti-IFN-γ (XMG1.2) and anti-CD8 (53-6.7) were purchased from eBioscience. IC-21, BMMΦ, or K41 cells were infected overnight with the panel of mutant viruses at a multiplicity of infection (MOI) of 20 in the presence of 0.3 mg/ml phosphonoacetic acid (PAA; Sigma-Aldrich). For intranuclear staining, cells were stained with cell surface Abs, then fixed with CytoFix/CytoPerm (BD Biosciences), then permeabilized by incubation for 5 min with 0.1% Triton X in PBS. The cells were then stained for 30 min with anti-pp89 in the presence of 0.1% Triton X. The cells were washed three times in 0.1% Triton X then washed one time in FACS buffer before analysis. All cells were analyzed using a FACSCalibur flow cytometer (BD Biosciences) in conjunction with CellQuest (BD Bioscience). All further analyses were performed using FlowJo software (Tree Star). A total of 104 target cells per well was plated in 96-well plates, infected with the indicated viruses at a MOI of 20, and labeled with 100 μCi 51Cr (NEN) in the presence of 0.3 mg/ml PAA for 12 h. For peptide-pulsed targets, 51Cr-labeled cells were incubated with 1 μM peptide for 1 h at 37°C and then washed three times. Effector cells were then added at the indicated E:T ratios, incubated for 6 h, and supernatants were harvested and assayed with a TopCount scintillation counter (Packard Instruments). Background 51Cr release was determined by incubating targets with medium alone, and total 51Cr release was determined by lysing targets with medium containing 1% Nonidet P40 (USB). Percentage of specific lysis was calculated as follows: (experimental cpm − background cpm)/(total cpm − background cpm). A total of 2 × 106 IC-21s was infected with wt MCMV at a MOI of 20 in the presence of PAA (0.3 mg/ml). RNA was extracted from cells harvested at 0, 1, 2, 3, 4, 6, 8, 12, 18, and 24-h postinfection using the Sigma GenElute Total Mammalian RNA kit (Sigma-Aldrich), quantified, and stored at −80°C. Samples were then DNase treated at 1 U/μg of RNA (Fermentas), and cDNA was then generated using the Invitrogen SuperScript III First-Strand Synthesis SuperMix (Invitrogen Life Technologies). To ensure that there was no DNA contamination, a portion of each sample was treated identically but without addition of reverse transcriptase (no RT controls). cDNA was stored at −20°C until needed. Quantitative PCR was performed using Platinum SYBR Green qPCR SuperMix UGD with ROX using the primers at 250 nM. The samples were run on an ABI PRISM 7700 Sequence Detection System. The program settings used were according to company specifications (Invitrogen Life Technologies). No product was detected from the no-RT controls. Relative gene expression was determined by normalizing each gene to β-actin as the control, and comparing the gene expression relative to cells at 0 h. The calculations were made following the method described in the User bulletin number 2: ABI Prism 7700 sequence detection system; subject, relative quantitation of gene expression (Applied Biosystems). The primers were tested by PCR and shown not to amplify nonspecific cellular genes. Primer sequences are available upon request. All primers were validated using the β-actin template as the control, using the method described by Applied Biosystems Guide to Performing Relative Quantitation of Gene Expression Using Real-Time Quantitative PCR. Statistical significance was determined using the Student’s t test. A paired two-tailed t test was used, and all comparisons were determined to be of equal variance. To assess the impact of MCMV’s VIPRs, we generated polyclonal CD8 T cell lines for use in 51Cr release assays. CTL lines specific for 16 of the identified C57BL/6 MCMV epitopes (Table I⇓) were generated by peptide restimulation of splenocytes from MCMV-infected mice, and were used after 7–14 days of culture. The macrophage cell line, IC-21, was used as a target because macrophages support the full virus replication cycle, and are important for viral dissemination in vivo (24). Infection was conducted in the presence of PAA, which inhibits viral DNA replication and hence late gene expression. We have previously shown that PAA treatment does not alter the pattern of CTL killing, nor the impact of the VIPRs (Ref. 11 , and A. K. Pinto, unpublished data). IC-21s were infected with wt MCMV or a virus lacking all three VIPRs (Δm04+m06+m152), and tested by 51Cr release assay for lysis by each of the epitope-specific CTL lines (Fig. 1⇓, A and B). In every case, the CTL readily lysed targets infected with Δm04+m06+m152 but failed to lyse wt virus-infected and uninfected targets. We concluded that the combination of all three VIPRs is highly effective at inhibiting Ag-specific CD8 T cell function for all epitopes tested. Lysis of Δm04+m06+m152 but not wt MCMV by 16 epitope-specific CD8 T cell lines. 51Cr release assay on uninfected, infected, and peptide-pulsed IC-21s. T cell lines were generated from splenocytes from C57BL/6 mice that had been infected with MCMV for >11 wk. Splenocytes were pulsed with MCMV peptide at 10−8 M and cultured for 14 days before being used in the 51Cr release assay. A, Db-restricted epitopes; B, Kb-restricted epitopes. The complete inhibition of CTL lysis when all three MCMV VIPRs are present is remarkably efficient. To address the relative contribution of the individual VIPRs to this inhibition, we used the panel of BAC-derived mutant viruses lacking each VIPR alone and in combination (6) (Table II⇓). To correlate cell surface class I levels with the functional killing assays, we first assessed the impact of the VIPRs on cell surface class I levels on IC-21s using the same conditions that we used for 51Cr release assays. Flow cytometry was performed 16 h after infection in the presence of PAA (Fig. 2⇓). Infection with wt MCMV caused a marked down-regulation of both H-2Kb and H-2Db as compared with uninfected cells (Fig. 2⇓A). However, cells infected with Δm04+m06+m152 showed no reduction of cell surface class I compared with uninfected cells. This confirmed the conclusion of Wagner et al. (6), that m04, m06, and m152 are the only MCMV genes that affect cell surface MHC class I. Impact of MCMV VIPRs on MHC class I cell surface expression. MCMV VIPR effects on MHC class I cell surface expression. A, Cell surface staining of the MHC class I on IC-21s. Uninfected, gray line; wt MCMV, solid black lines; and Δm04+m06+m152, dotted line. B, Cell surface class I expression in IC-21s comparing the effects of the individual VIPRs. 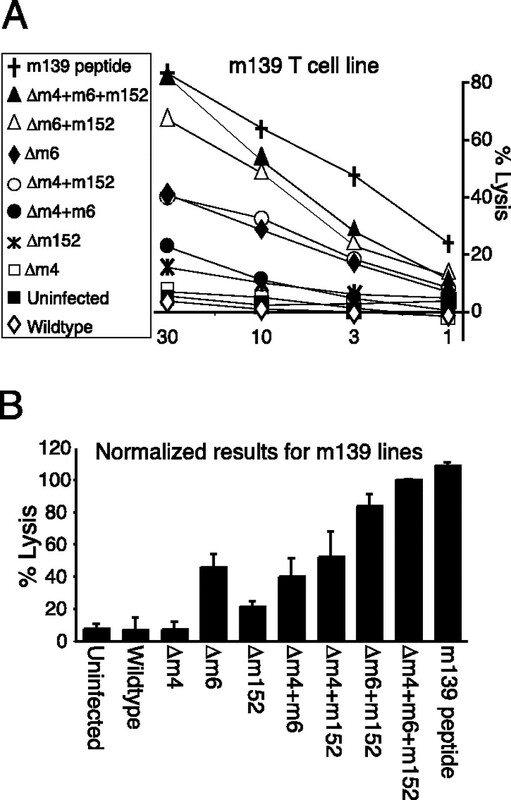 The mutant virus infections, gray filled in histograms; wt MCMV, solid black line; and Δm04+m06+m152, dotted line. C, Average MFI of class I surface expression normalize to Δm04+m06+m152. Normalized results of three independent experiments; bars, the mean values of the percentage of class I expression relative to the class I expression Δm04+m06+m152. D, Similar to C, normalized results of three independent experiments; bars, the mean values of the percentage of class I expression relative to the class I expression Δm04+m06+m152 for IC-21s, BMMΦ, and K41s (transformed fibroblasts). We next assessed the impact of each of the individual VIPRs on cell surface expression of Kb and Db, by comparing the results for the panel of mutants to that of wt and Δm04+m06+m152-infected IC-21s (Fig. 2⇑B). These experiments were also performed in BMMΦ and K41s (SV40-transformed H-2b+ fibroblasts). K41s were used to compare these results with the previous study, which was performed in transformed fibroblasts after 12 h of infection without PAA (6). To facilitate this analysis, the mean fluorescence intensity (MFI) of Kb and Db for cells infected with each of the mutants was expressed as a percentage of the MFI in cells infected with Δm04+m06+m152 (Fig. 2⇑C). Fig. 2⇑D shows the mean ± SD of three such normalized assays for IC-21s, K41s, and BMMΦ. We note first that the overall pattern between all the cell types tested was very similar. The current study of fibroblasts (Fig. 2⇑D) gave similar results to the previously published report (6). In general, the impact of the VIPRs in infected macrophages was similar to fibroblasts, although the differential impact on Kb vs Db was less striking. In agreement with the previous results, we observed in macrophages that (1) the impact of m152 alone, seen in Δm04+m06 infection, was greater on Db than on Kb (49% reduction of Db compared with 66% reduction of Kb), and (2) m06 had a greater impact on Kb than did m152 (82% reduction by m06 alone compared with 63% reduction by m152 alone). m04 had little impact on cell surface class I in all cell types tested. In the previous (6) study of fibroblasts, it was observed that that m04 antagonized the impact of m152. However, little evidence for such antagonism was observed under the conditions used in the current study. To examine the functional impact of the VIPRs, polyclonal T cell lines were used in 51Cr release assays against IC-21s infected with each of the mutant viruses listed in Table II⇑; an example is shown in Fig. 3⇓A. Each epitope specificity was tested at least three times. To integrate the data from multiple assays, the results for each assay were normalized, with lysis of each of the mutants expressed as a percentage of the lysis in cells infected with Δm04+m06+m152 using an E:T ratio that was below the plateau of maximum killing. The mean and standard of multiple assays were then calculated, as shown in Fig. 3⇓B. Experimental setup for 51Cr assay analysis. A, Representative 51Cr assay using IC-21 as the target cell line. The highest E:T ratio is identified. B, The normalized results of the 51Cr assay with percentage of lysis of Δm04+m06+m152 at the highest E:T ratio set to 100%, and the percentage of killing of the other mutant viruses normalized to Δm04+m06+m0152. Fig. 4⇓ shows the results of this analysis for each of the epitopes listed in Table I⇑. The data are grouped by lysis of individual mutant viruses and are arranged to show the effect of the loss of a single VIPR in Fig. 4⇓, left column, and the impact of the VIPR alone on the right. For example, for m04, the panel on the left shows Δm04, and the panel on the right shows Δm06+m152 (Fig. 4⇓). To facilitate comparison, the normalized cell surface staining for Kb and Db from Fig. 2⇑ is shown alongside the normalized specific lysis. These experiments were performed over a period of 12 mo, using CTL lines specific for the same epitopes but derived from different animals. Nevertheless, the pattern of lysis of the individual mutants was consistent for each epitope, allowing statistically valid comparisons to be made. The asterisks indicate a significant increase in lysis compared with wt infection, and the crosses indicate a significant inhibition of lysis compared with Δm04+m06+m152. Comparison of the impact of the VIPRs alone and in combination on lysis by CTL specific for 15 epitopes. The results are normalized to Δm04+m06+m152, which was set at 100% lysis. The ▦ are the Db-restricted peptide epitopes, and the □ are the Kb-restricted peptide epitopes. The ∗ indicates a significant recognition above wt infection; the † indicates a significant inhibition of recognition compared with Δm04+m06+m152; and # is a significant difference between the mutant viruses. A, The effects of the VIPRs on class I cell surface expression and CTL recognition. B, Normalized 51Cr assays comparing the contributions of m06 and m152 alone and together. C, Comparing the addition of m04 to m06 at inhibiting CTL recognition. D, Normalized 51Cr results m152 comparing to m152 with m04. Error bars represent SD. 1) All three VIPRs were needed to completely prevent lysis of wt-infected cells by CTL specific for all 15 epitopes. Although most Ags could be inhibited by the combined actions of m06 and m152, there were three epitopes, M33, M36, and M78, that required the presence of m04 for complete inhibition (i.e., Δm04-infected cells were lysed significantly better than wt-infected cells). 2) There was significant difference in efficacy of the individual VIPRs for different epitopes. For example, for most epitopes, m04 alone had no impact, evidenced by lysis of Δm06+m152 that was close to that of Δm04+m06+m152. However, M78-specific CTL seemed peculiarly sensitive to the actions of m04: lysis by M78-specific cells was significantly impaired by m04 alone, and M78-specific CTL could also lyse Δm04-infected cells. In fact, for M78-specific CTL, the impact of m04 alone was similar to that of m06 alone, and only slightly less than that of m152 alone. All other epitopes were more affected by m06 and/or m152 than by m04, with m152 generally having the greatest impact. However, there was also differential susceptibility to these two VIPRs. For example, compare the ability of different Db-restricted CTL to lyse cells infected with Δm152. In addition, epitopes such as Kb-M100 were equally impacted by m152 alone (60% inhibition) and m06 alone (60% inhibition), whereas others such as Kb-M38 were much more affected by m152 alone (60% inhibition) than m06 alone (10% inhibition). 3) Inhibition of killing was not directly proportional to down-regulation of cell surface class I levels by m06 and m152. Overall, the two VIPRs that down-regulate cell surface class I, m06 and m152, also had the greatest impact on CTL lysis. However, for these two VIPRs, the degree of down-regulation of Kb and Db did not directly predict their impact on CTL lysis. For instance, m06 alone had a slightly greater impact on cell surface levels of Kb than did m152 alone (82% inhibition in Δm04+m152 vs 65% inhibition in Δm04+m06), yet m152 alone was generally more potent at inhibiting killing by Kb-restricted CTL. Similarly, cell surface Db was equally down-regulated by m06 and m152, yet m152 more potently affected Db-restricted killing. 4) There was little or no differential impact of the individual VIPRs on Kb-restricted vs Db-restricted CTL lysis. Our previous hypothesis that m04 would play a role in Kb-restricted but not Db-restricted killing is clearly incorrect: CTL specific for one Kb-restricted epitope (M78) and two Db-restricted epitopes (M33 and M36) were able to lyse cells infected with Δm04. In addition, the major difference in the impact of m152 on Kb vs Db that had been predicted based on pulse chase analysis (11) and cell surface staining (6) was not observed. These assays have also enabled us to assess the extent to which the VIPRs act cooperatively, i.e., add to each other’s impact, and also to ask whether any evidence for antagonism between m152 and m04 is seen at the functional level, as was predicted from surface MHC I expression levels (6). To facilitate this analysis, we have displayed the data from Fig. 4⇑A again in Fig. 4⇑, B–D, showing for each epitope the impact of an individual VIPR, either m06 or m152, with the addition of m04. Several conclusions can be drawn. 1) Strong cooperation was seen between m06 and m152 (Fig. 4⇑B), which together inhibited lysis by most of the epitope-specific CTL. As described above, the necessity of a contribution from m04, evidenced by lysis of cells infected with Δm04, was only seen for M78-Kb, M33-Db, and M36-Db. 2) m04 acted cooperatively with m06 (Fig. 4⇑C). Although m04 alone had little impact, m04 was observed to add to the ability of m06 to inhibit lysis. When we compared the impact of m06 alone (lysis of Δm04+m152) to the impact of m04 in combination with m06 (Δm152), it was clear that m04 enhanced the ability of m06 to inhibit CTL lysis. This was seen for two Db-restricted epitopes and four Kb-restricted epitopes. 3) The addition of m04 to m152 generally had little impact (Fig. 4⇑D). For only one epitope (M36), addition of m04 added to the inhibition observed with m152 alone (p = 0.05). The opposite effect (antagonism) was observed for M38 (p = 0.005). We have previously observed that Δm04-infected cells were readily lysed by several Kb-restricted CTL clones (10, 11). Lysis of Δm04-infected cells was particularly strong in primary BMMΦ. In the light of those previous results, we were surprised to find that Δm04-infected IC-21s were not lysed by most of the epitope-specific CTL lines examined in this study, including those specific for m141 and M97. There were two major differences between the previous study and that reported here: 1) the previous study used CTL clones rather than short-term, peptide-driven polyclonal lines; and 2) the previous study used primary macrophages rather than the transformed IC-21 cells used here. We wanted to reconcile the two studies. The CTL clones used in the previous study are no longer available, so we compared the ability of polyclonal CTL lines to lyse primary BMMΦ or IC-21s infected with wt MCMV or mutant viruses. Fig. 5⇓ shows that polyclonal CTL lines specific for M86, m141, and M38 lysed BMMΦ infected with Δm04, whereas they failed to lyse IC-21s infected with the same virus. Thus, a requirement for m04 to completely inhibit CTL lysis is seen more strongly in primary BMMΦ than in transformed macrophages. This increased requirement for VIPR function in primary BMMΦ seemed specific for m04, because in the same assays, lysis of cells infected with either Δm06 or Δm152 was similar for primary and transformed macrophages. We also note that even in primary BMMΦ, m04 displayed epitope-selectivity: M45-specific CTL failed to kill Δm04-infected BMMΦ, consistent with our previous results using CTL clones in both macrophages and fibroblasts. Comparison of the impact of the VIPRs in primary and transformed macrophages. The targets were either infected BMMΦ or infected IC-21s. Circles with the dashed lines, Δm4+m6+m152 targets; squares with the dashed lines, wt-infected targets; triangles, Δm04-infected targets; diamonds, Δm06-infected targets; stars, Δm152 targets. Error bars represent SD. 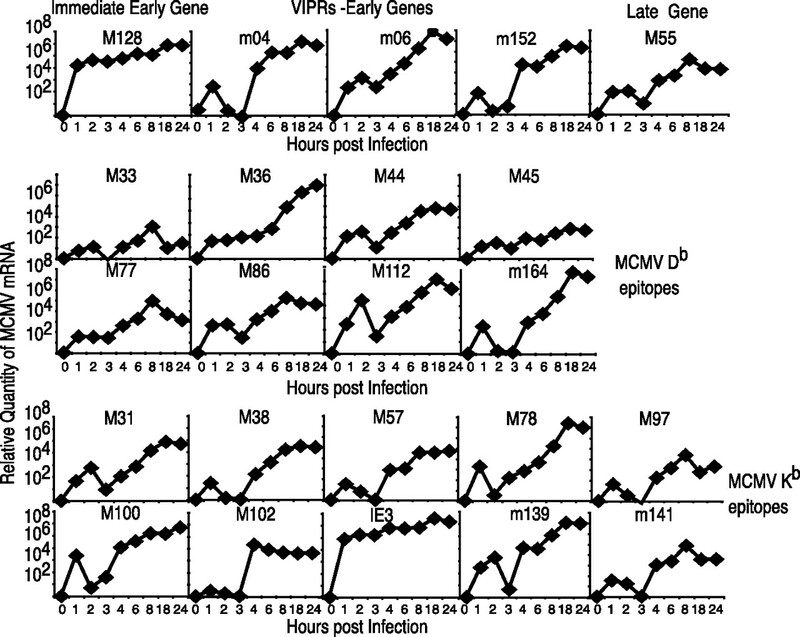 One obvious explanation for the differential impact of the VIPRs on different epitopes could be the relative timing of expression of the viral Ags and the VIPRs. In primary fibroblasts, low levels of m06 transcripts were observed from the beginning of infection (25). High levels of transcription were first seen for m152, followed by m04 and then m06. Whereas m04 and m06 expression continued throughout the infectious cycle, m152 expression decreased at later time points. We therefore postulated that m152 might have a greater impact on the earliest expressed genes, and m06 on those expressed later. To correlate gene expression with the results reported in this study, we examined gene expression by quantitative RT-PCR in IC-21s that were infected in identical conditions to those used for the 51Cr release assays (Fig. 6⇓). Kinetics of transcription of the VIPRs and Ags. IC-21s were infected as described above, and transcript levels were assessed by real-time PCR. The relative gene expression of each of the MCMV genes was determined after each time point was normalized to a β-actin control. The expression kinetics of most genes examined here was rather similar, with expression beginning at 3 or 4 h postinfection, consistent with their expected early kinetics. An unexpected small early peak of transcription for many genes at 1 h postinfection was observed in repeated assays. Because of the high MOI used here, this is probably due to virion-associated transcripts, as have been described for other herpesviruses (26, 27, 28). A higher level of transcription of the known immediately early (IE) genes, M122, m123, and m128, was detected at all time points. m04 and m152 were expressed with similar early kinetics, with transcription clearly detected at 4-h postinfection and then increasing slightly throughout the 24-h period. Some transcription of m06 was detected at all time points, but maximal transcription of m06 occurred later than m04 and m152, very similar to the pattern described for fibroblasts (29). We were unable to identify a correlation between the time that transcription of a gene was detected and the ability of the VIPRs to inhibit presentation of its encoded epitope. For example, the IE3 transcript (M122) was one of only three transcripts we could identify that appeared earlier than both m04 and m152, yet lysis of cells by IE3-specific CTL was efficiently inhibited by combined actions of m06 and m152 (Fig. 4⇑). Similarly, there was nothing unusual about the transcription kinetics of M78 and m04 that might explain the unique susceptibility of Kb-M78 to inhibition by m04. There have been almost no studies addressing the impact of VIPR multiplicity at a functional level. Studies with one or two epitopes can generate inaccurate overgeneralizations, as we discovered with m04 (Ref. 10 , and Fig. 4⇑ above). The fact that the CD8 T cell response of C57BL/6 mice to MCMV is remarkably broad—encompassing at least 26 epitopes identified to date—suggested that we now had a large enough range of epitope specificities to more accurately test some of these ideas. These experiments confirmed that the VIPRs act as a single entity to inhibit CTL lysis. In fact, the three VIPRs acting together are remarkably efficient at inhibiting lysis of infected macrophages by CTLs specific for all of the H-2b-restricted epitopes tested. Thus, the surprisingly modest impact of the VIPRs in vivo in C57BL/6 mice (30) is not likely to be explained by there being major populations of CD8 T cells that are unaffected by the VIPRs. The results in Fig. 1⇑ show that the three VIPRs cooperatively have a powerful impact on CTL efficacy, which is likely to translate into at least a quantitative impact on CTL efficacy in vivo, as has been demonstrated for the M45 epitope (31). Furthermore, a profound impact was seen for all 15 epitopes tested, which cover the majority of the CTL response in C57BL/6 mice (13). This highly efficient inhibition of lysis is slightly at odds with the results obtained by the Reddehase (19) and Koszinowski (7) groups in the BALB/c system, where the VIPRs sometimes fail to completely inhibit lysis in 51Cr release assays. Because we (32) and the Reddehase et al. (31) group have at least partially confirmed each other’s results, it seems likely that these are genuine mouse strain differences, rather than differences in experimental methodology. Further work is needed to uncover the basis of these strain differences. More importantly, the paradox between the profound inhibition of lysis observed in 51Cr release assays in vitro, and the fact that the VIPRs do not have a major impact on virus survival or the CTL response in vivo (Refs. 30 , 31 , 50 , and M. W. Munks, A. K. Pinto, A. Lang, C. M. Doom, J. Nikolich-Žugich, and A. B. Hill, submitted for publication), remains to be resolved. Our previous results suggested that m04/gp34 plays a greater role in macrophages than in fibroblasts (11). The results in this study provide an interesting twist to this story, demonstrating a greater need for a contribution from m04/gp34 to inhibit Ag presentation in primary macrophages than in transformed macrophages. This was particularly intriguing because the impact of m06 and m152 was similar in primary and transformed macrophages. Transcription of MCMV genes could also be different in the two cell types. We would predict that the altered gene expression profile is responsible for the differential impact of m04/gp34. However, because the mechanism of m04/gp34’s inhibition of Ag presentation remains unknown, it is difficult to speculate on the mechanism of the difference between cell types. There is strong evidence in the literature that different VIPRs act preferentially on different class I isoforms (6, 10, 33, 34). Because a differential impact of MCMV VIPRs on Kb vs Db was clearly observed in previous studies (6, 10), we fully expected to see preferential activity of m06 and m152 against Kb vs Db-restricted presentation. Surprisingly, we found no consistent difference in the impact of any VIPR on these two class I isoforms. Instead, a difference in individual epitopes susceptibility to the VIPRs was much more striking than any overall difference between the class I isoforms. Such epitope selectivity was not readily explained by the timing of gene expression of individual Ags relative to the different VIPRs. This study also revealed that the impact of individual VIPRs on total cell surface class I levels did not correlate directly with their impact on CTL lysis. In particular, m152’s impact on CTL lysis was disproportionately greater than its impact on cell surface class I. The explanation that this disproportionate impact would be explained by m152’s impact on NKG2D ligands was appealing, but experimental data suggests that NKG2D inhibition contributes only very modestly to m152’s overall impact on CTL lysis (A. K. Pinto, A. M. Jamieson, D. H. Raulet, and A. B. Hill, manuscript in preparation). There was no obvious correlation between the sequence of the peptide epitope, nor its functional avidity (Table I⇑), and susceptibility to individual VIPRs. In this study, we have quantified Ag transcript levels and the final outcome of Ag presentation (peptide titration in 51Cr release assays in Δm04+m06+m152-infected cells; Table I⇑). However, the entire intervening sequence of events—protein synthesis, proteasomal degradation, TAP transport, loading onto MHC class I, and stability of the resultant complexes—have not been quantified, and it is quite possible that quantitative differences in these processes will affect the relative impact of the VIPRs. The contribution to epitope selectivity of such quantitative differences, and qualitative considerations such as the site and nature of the MHC class I cargo targeted by each VIPR, remains to be determined. Since the discovery of VIPRs to CD8 T cells, it has been intriguing that many herpesviruses encode multiple genes with this function. Kaposi’s sarcoma-associated herpesvirus encodes at least two (K3 and K5) (35, 36, 37), HCMV at least 4 (US2, US3, US6, and US11) (reviewed in Ref. 38), and rhesus CMV encodes homologs of all four HCMV VIPRs and also has an additional locus that prevents class I H chain synthesis (C. Powers and K. Frueh, manuscript in preparation). As described above, MCMV encodes three identified VIPRs. Several hypotheses have been proposed to explain the advantage of multiple VIPRs. Ahn et al. (39) noted that HCMV’s VIPRs are expressed sequentially. US3, which retains class I in the ER, is expressed first, and these authors proposed that it may serve to “setup” class I for more efficient destruction by the later expression of US2 and US11. Whether different VIPRs act synergistically in this way or merely additively, the comprehensive study reported here demonstrates that the VIPRs have evolved to function in concert to completely inhibit CD8 T cell lysis. CMVs have been coevolving with their hosts’ immune systems since before the mammalian radiation 60–80 million years ago. Because MCMV is a natural pathogen of the laboratory mouse (Mus musculus), most of the multiple layers of intricate immune modulation, including those that are highly species specific, are likely to be fully functional in this model. Such layers of immune modulation may help to explain the paradox that the VIPRs act with exquisite coordination to inhibit CTL lysis in vitro but have a rather minor impact on viral pathogenesis in intact mice in vivo. ↵1 This research was support by National Institutes of Health (AI47206A and AI50099A; to A.B.H. ), American Heart Association Fellowship (0215188Z; to A.K.P. ), National Eye Institute training grant (ACAEI0071; to A.K.P. ), and Deutsche Forschungsgemeinschaft (SFB 455; to U.H.K.). ↵3 Abbreviations used in this paper used in this paper: MCMV, murine CMV; ER, endoplasmic reticulum; ERGIC, ER-Golgi intermediate compartment; HCMV, human CMV; BAC, bacterial artificial chromosome; BMMΦ, primary bone marrow macrophage; wt, wild type; MOI, multiplicity of infection; PAA, phosphonoacetic acid; RT, reverse transcriptase; MFI, mean fluorescence intensity; IE, immediately early. del Val, M., H. Hengel, H. Hacker, U. Hartlaub, T. Ruppert, P. Lucin, U. H. Koszinowski. 1992. Cytomegalovirus prevents antigen presentation by blocking the transport of peptide-loaded major histocompatibility complex class I molecules into the medial-Golgi compartment. J. Exp. Med. 176: 729-738. Thale, R., U. Szepan, H. Hengel, G. Geginat, P. Lucin, U. H. Koszinowski. 1995. Identification of the mouse cytomegalovirus genomic region affecting major histocompatibility complex class I molecule transport. J. Virol. 69: 6098-6105. Ziegler, H., R. Thale, P. Lucin, W. Muranyi, T. Flohr, H. Hengel, H. Farrell, W. Rawlinson, U. H. Koszinowski. 1997. A mouse cytomegalovirus glycoprotein retains MHC class I complexes in the ERGIC/cis-Golgi compartments. Immunity 6: 57-66. Reusch, U., W. Muranyi, P. Lucin, H. G. Burgert, H. Hengel, U. H. Koszinowski. 1999. A cytomegalovirus glycoprotein re-routes MHC class I complexes to lysosomes for degradation. EMBO J. 18: 1081-1091. Wagner, M., A. Gutermann, J. Podlech, M. J. Reddehase, U. H. Koszinowski. 2002. Major histocompatibility complex class I allele-specific cooperative and competitive interactions between immune evasion proteins of cytomegalovirus. J. Exp. Med. 196: 805-816. Hengel, H., U. Reusch, A. Gutermann, H. Ziegler, S. Jonjic, P. Lucin, U. H. Koszinowski. 1999. Cytomegaloviral control of MHC class I function in the mouse. Immunol. Rev. 168: 167-176. Kleijnen, M. F., J. B. Huppa, P. Lucin, S. Mukherjee, H. Farrell, A. E. Campbell, U. H. Koszinowski, A. B. Hill, H. L. Ploegh. 1997. A mouse cytomegalovirus glycoprotein, gp34, forms a complex with folded class I MHC molecules in the ER which is not retained but is transported to the cell surface. EMBO J. 16: 685-694. Kavanagh, D. G., U. H. Koszinowski, A. B. Hill. 2001. The murine cytomegalovirus immune evasion protein m4/gp34 forms biochemically distinct complexes with class I MHC at the cell surface and in a pre-Golgi compartment. J. Immunol. 167: 3894-3902. Kavanagh, D. G., M. C. Gold, M. Wagner, U. H. Koszinowski, A. B. Hill. 2001. 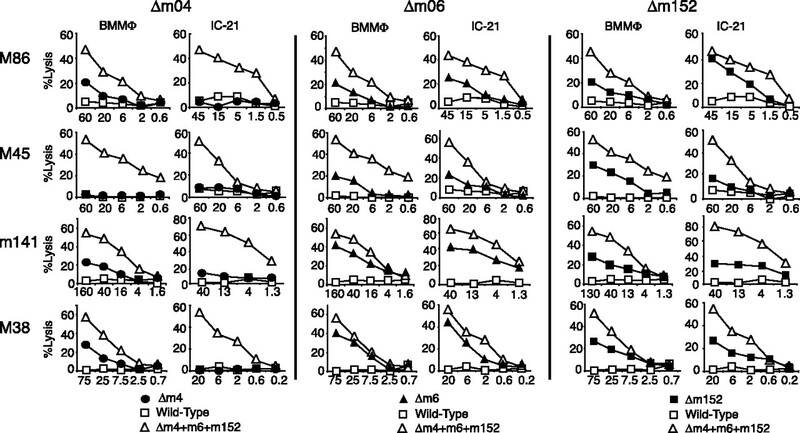 The multiple immune-evasion genes of murine cytomegalovirus are not redundant: m4 and m152 inhibit antigen presentation in a complementary and cooperative fashion. J. Exp. Med. 194: 967-978. LoPiccolo, D. M., M. C. Gold, D. G. Kavanagh, M. Wagner, U. H. Koszinowski, A. B. Hill. 2003. Effective inhibition of Kb- and Db-restricted antigen presentation in primary macrophages by murine cytomegalovirus. J. Virol. 77: 301-308. Krogsgaard, M., J. B. Huppa, M. A. Purbhoo, M. M. Davis. 2003. Linking molecular and cellular events in T-cell activation and synapse formation. Semin. Immunol. 15: 307-315. Munks, M. W., M. C. Gold, A. L. Zajac, C. M. Doom, C. S. Morello, D. H. Spector, A. B. Hill. 2006. Genome-wide analysis reveals a highly diverse CD8 T cell response to murine cytomegalovirus. J. Immunol. 176: 3760-3766. Cavanaugh, V. J., R. M. Stenberg, T. L. Staley, H. W. Virgin, 4th, M. R. MacDonald, S. Paetzold, H. E. Farrell, W. D. Rawlinson, A. E. Campbell. 1996. Murine cytomegalovirus with a deletion of genes spanning HindIII-J and -I displays altered cell and tissue tropism. J. Virol. 70: 1365-1374. Driessen, C., R. A. Bryant, A. M. Lennon-Dumenil, J. A. Villadangos, P. W. Bryant, G. P. Shi, H. A. Chapman, H. L. Ploegh. 1999. Cathepsin S controls the trafficking and maturation of MHC class II molecules in dendritic cells. J. Cell Biol. 147: 775-790. Wagner, M., S. Jonjic, U. H. Koszinowski, M. Messerle. 1999. Systematic excision of vector sequences from the BAC-cloned herpesvirus genome during virus reconstitution. J. Virol. 73: 7056-7060. Brune, W., W. Hartmut Hengel, H. Koszinowski Ulrich. 2006. A Mouse Model for Cytomegalovirus Infection. Current Protocols in Immunology John Wiley and Sons, New York. Loh, L. C., N. Balachandran, L. F. Qualtiere. 1988. Characterization of a major virion envelope glycoprotein complex of murine cytomegalovirus and its immunological cross-reactivity with human cytomegalovirus. Virology 166: 206-216. Loh, L. C., L. F. Qualtiere. 1988. A neutralizing monoclonal antibody recognizes an 87K envelope glycoprotein on the murine cytomegalovirus virion. Virology 162: 498-502. Rapp, M., P. Lucin, M. Messerle, L. C. Loh, U. H. Koszinowski. 1994. Expression of the murine cytomegalovirus glycoprotein H by recombinant vaccinia virus. J. Gen. Virol. 75: 183-188. (Pt 1). Del Val, M., H. Volkmer, J. B. Rothbard, S. Jonjic, M. Messerle, J. Schickedanz, M. J. Reddehase, U. H. Koszinowski. 1988. Molecular basis for cytolytic T-lymphocyte recognition of the murine cytomegalovirus immediate-early protein pp89. J. Virol. 62: 3965-3972. Hardy, R.. 1986. Purification and Coupling of Fluorescent Proteins for Use in Flow Cytometry. D. M. Weir, 4th, and L. A. Herzenberg, 4th, and C. Blackwell, 4th, eds. Handbook of Experimental Immunology 4th Ed.31.1-31.12. Blackwell Scientific Publications, Boston. Pollock, J. L., R. M. Presti, S. Paetzold, H. W. Virgin, 4th. 1997. Latent murine cytomegalovirus infection in macrophages. Virology 227: 168-179. Reddehase, M. J., W. Mutter, K. Munch, H. J. Buhring, U. H. Koszinowski. 1987. CD8-positive T lymphocytes specific for murine cytomegalovirus immediate-early antigens mediate protective immunity. J. Virol. 61: 3102-3108. Terhune, S. S., J. Schroer, T. Shenk. 2004. RNAs are packaged into human cytomegalovirus virions in proportion to their intracellular concentration. J. Virol. 78: 10390-10398. Sciortino, M.-T., M. Suzuki, B. Taddeo, B. Roizman. 2001. RNAs extracted from herpes simplex virus 1 virions: apparent selectivity of viral but not cellular RNAs packaged in virions. J. Virol. 75: 8105-8116. Bresnahan, W. A., T. Shenk. 2000. A subset of viral transcripts packaged within human cytomegalovirus particles. Science 288: 2373-2376. Holtappels, R., N. K. Grzimek, C. O. Simon, D. Thomas, D. Dreis, M. J. Reddehase. 2002. Processing and presentation of murine cytomegalovirus pORFm164-derived peptide in fibroblasts in the face of all viral immunosubversive early gene functions. J. Virol. 76: 6044-6053. Gold, M. C., M. W. Munks, M. Wagner, C. W. McMahon, A. Kelly, D. G. Kavanagh, M. K. Slifka, U. H. Koszinowski, D. H. Raulet, A. B. Hill. 2004. Murine cytomegalovirus interference with antigen presentation has little effect on the size or the effector memory phenotype of the CD8 T cell response. J. Immunol. 172: 6944-6953. Holtappels, R., J. Podlech, M.-F. Pahl-Seibert, M. Julch, D. Thomas, C. O. Simon, M. Wagner, M. J. Reddehase. 2004. Cytomegalovirus misleads its host by priming of CD8 T cells specific for an epitope not presented in infected tissues. J. Exp. Med. 199: 131-136. Lu, X., A. K. Pinto, A. M. Kelly, K. S. Cho, A. B. Hill. 2006. Murine cytomegalovirus interference with antigen presentation contributes to the inability of CD8 T cells to control virus in the salivary gland. J. Virol. 80: 4200-4202. Machold, R. P., E. J. Wiertz, T. R. Jones, H. L. Ploegh. 1997. The HCMV gene products US11 and US2 differ in their ability to attack allelic forms of murine major histocompatibility complex (MHC) class I heavy chains. J. Exp. Med. 185: 363-366. Wiertz, E. J., T. R. Jones, L. Sun, M. Bogyo, H. J. Geuze, H. L. Ploegh. 1996. The human cytomegalovirus US11 gene product dislocates MHC class I heavy chains from the endoplasmic reticulum to the cytosol. Cell 84: 769-779. Stevenson, P. G., S. Efstathiou, P. C. Doherty, P. J. Lehner. 2000. Inhibition of MHC class I-restricted antigen presentation by γ2-herpesviruses. Proc. Natl. Acad. Sci. USA 97: 8455-8460. Ishido, S., C. Wang, B.-S. Lee, G. B. Cohen, J. U. Jung. 2000. Downregulation of major histocompatibility complex class I molecules by Kaposi’s sarcoma-associated herpesvirus K3 and K5 proteins. J. Virol. 74: 5300-5309. Coscoy, L., D. Ganem. 2000. Kaposi’s sarcoma-associated herpesvirus encodes two proteins that block cell surface display of MHC class I chains by enhancing their endocytosis. Proc. Natl. Acad. Sci. USA 97: 8051-8056. Loenen, W. A. M., C. A. Bruggeman, E. J. H. J. Wiertz. 2001. Immune evasion by human cytomegalovirus: lessons in immunology and cell biology. Semin. Immunol. 13: 41-49. Ahn, K., A. Angulo, P. Ghazal, P. A. Peterson, Y. Yang, K. Fruh. 1996. Human cytomegalovirus inhibits antigen presentation by a sequential multistep process. Proc. Natl. Acad. Sci. USA 93: 10990-10995. Kattenhorn, L. M., R. Mills, M. Wagner, A. Lomsadze, V. Makeev, M. Borodovsky, H. L. Ploegh, B. M. Kessler. 2004. Identification of proteins associated with murine cytomegalovirus virions. J. Virol. 78: 11187-11197. Davis-Poynter, N. J., D. M. Lynch, H. Vally, G. R. Shellam, W. D. Rawlinson, B. G. Barrell, H. E. Farrell. 1997. Identification and characterization of a G protein-coupled receptor homolog encoded by murine cytomegalovirus. J. Virol. 71: 1521-1529. Melnychuk, R. M., P. Smith, C. N. Kreklywich, F. Ruchti, J. Vomaske, L. Hall, L. Loh, J. A. Nelson, S. L. Orloff, D. N. Streblow. 2005. Mouse cytomegalovirus M33 is necessary and sufficient in virus-induced vascular smooth muscle cell migration. J. Virol. 79: 10788-10795. McCormick, A. L., A. Skaletskaya, P. A. Barry, E. S. Mocarski, V. S. Goldmacher. 2003. Differential function and expression of the viral inhibitor of caspase 8-induced apoptosis (vICA) and the viral mitochondria-localized inhibitor of apoptosis (vMIA) cell death suppressors conserved in primate and rodent cytomegaloviruses. Virology 316: 221-233. Menard, C., M. Wagner, Z. Ruzsics, K. Holak, W. Brune, A. E. Campbell, U. H. Koszinowski. 2003. Role of murine cytomegalovirus US22 gene family members in replication in macrophages. J. Virol. 77: 5557-5570. McCormick, A. L., C. D. Meiering, G. B. Smith, E. S. Mocarski. 2005. Mitochondrial cell death suppressors carried by human and murine cytomegalovirus confer resistance to proteasome inhibitor-induced apoptosis. J. Virol. 79: 12205-12217. Loh, L. C., V. D. Keeler, J. D. Shanley. 1999. Sequence requirements for the nuclear localization of the murine cytomegalovirus M44 gene product pp50. Virology 259: 43-59. Loh, L. C., D. Locke, R. Melnychuk, S. Laferte. 2000. The RGD sequence in the cytomegalovirus DNA polymerase accessory protein can mediate cell adhesion. Virology 272: 302-314. Brune, W., C. Menard, J. Heesemann, U. H. Koszinowski. 2001. A ribonucleotide reductase homolog of cytomegalovirus and endothelial cell tropism. Science 291: 303-305. Gold, M. C., M. W. Munks, M. Wagner, U. H. Koszinowski, A. B. Hill, S. P. Fling. 2002. 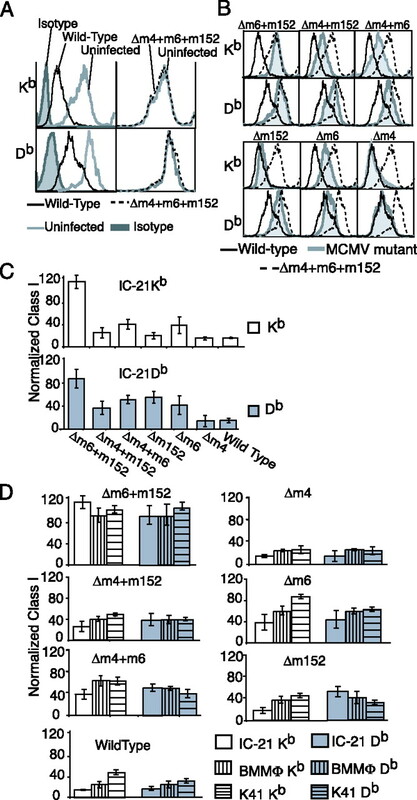 The murine cytomegalovirus immunomodulatory gene m152 prevents recognition of infected cells by M45-specific CTL but does not alter the immunodominance of the M45-specific CD8 T cell response in vivo. J. Immunol. 169: 359-365. Lembo, D., G. Gribaudo, A. Hofer, L. Riera, M. Cornaglia, A. Mondo, A. Angeretti, M. Gariglio, L. Thelander, S. Landolfo. 2000. Expression of an altered ribonucleotide reductase activity associated with the replication of murine cytomegalovirus in quiescent fibroblasts. J. Virol. 74: 11557-11565. Messerle, M., G. M. Keil, K. Schneider, U. H. Koszinowski. 1992. Characterization of the murine cytomegalovirus genes encoding the major DNA binding protein and the ICP18.5 homolog. Virology 191: 355-367. Oliveira, S. A., T. E. Shenk. 2001. Murine cytomegalovirus M78 protein, a G protein-coupled receptor homologue, is a constituent of the virion and facilitates accumulation of immediate-early viral mRNA. Proc. Natl. Acad. Sci. USA 98: 3237-3242. Kucic, N., H. Mahmutefendic, P. Lucin. 2005. Inhibition of protein kinases C prevents murine cytomegalovirus replication. J. Gen. Virol. 86: 2153-2161. Morello, C. S., L. D. Cranmer, D. H. Spector. 2000. Suppression of murine cytomegalovirus (MCMV) replication with a DNA vaccine encoding MCMV M84 (a homolog of human cytomegalovirus pp65). J. Virol. 74: 3696-3708. Michel, D., T. Mertens. 2004. The UL97 protein kinase of human cytomegalovirus and homologues in other herpesviruses: impact on virus and host. Biochim. Biophys. Acta 1697: 169-180. Rawlinson, W. D., F. Zeng, H. E. Farrell, A. L. Cunningham, A. A. Scalzo, T. W. Booth, G. M. Scott. 1997. The murine cytomegalovirus (MCMV) homolog of the HCMV phosphotransferase (UL97pk) gene. Virology 233: 358-363. Scott, G. M., H. L. Ng, C. J. Morton, M. W. Parker, W. D. Rawlinson. 2005. Murine cytomegalovirus resistant to antivirals has genetic correlates with human cytomegalovirus. J. Gen. Virol. 86: 2141-2151. Wagner, M., D. Michel, P. Schaarschmidt, B. Vaida, S. Jonjic, M. Messerle, T. Mertens, U. Koszinowski. 2000. Comparison between human cytomegalovirus pUL97 and murine cytomegalovirus (MCMV) pM97 expressed by MCMV and vaccinia virus: pM97 does not confer ganciclovir sensitivity. J. Virol. 74: 10729-10736. Scalzo, A. A., C. A. Forbes, N. J. Davis-Poynter, H. E. Farrell, P. A. Lyons. 1995. DNA sequence and transcriptional analysis of the glycoprotein M gene of murine cytomegalovirus. J. Gen. Virol. 76: 2895-2901. (Pt 11). Angulo, A., P. Ghazal, M. Messerle. 2000. The major immediate-early gene ie3 of mouse cytomegalovirus is essential for viral growth. J. Virol. 74: 11129-11136. Keil, G. M., A. Ebeling-Keil, U. H. Koszinowski. 1987. Immediate-early genes of murine cytomegalovirus: location, transcripts, and translation products. J. Virol. 61: 526-533. Koszinowski, U. H., M. J. Reddehase, G. M. Keil, J. Schickedanz. 1987. Host immune response to cytomegalovirus: products of transfected viral immediate-early genes are recognized by cloned cytolytic T lymphocytes. J. Virol. 61: 2054-2058. Manning, W. C., E. S. Mocarski. 1988. Insertional mutagenesis of the murine cytomegalovirus genome: one prominent α gene (ie2) is dispensable for growth. Virology 167: 477-484. Martinotti, M. G., G. Gribaudo, M. Gariglio, A. Caliendo, D. Lembo, A. Angeretti, R. Cavallo, S. Landolfo. 1993. Effect of interferon-α on immediate early gene expression of murine cytomegalovirus. J. Interferon Res. 13: 105-109. Messerle, M., B. Buhler, G. M. Keil, U. H. Koszinowski. 1992. Structural organization, expression, and functional characterization of the murine cytomegalovirus immediate-early gene 3. J. Virol. 66: 27-36. Sandford, G. R., K. Ho, W. H. Burns. 1993. Characterization of the major locus of immediate-early genes of rat cytomegalovirus. J. Virol. 67: 4093-4103. Hanson, L. K., B. L. Dalton, Z. Karabekian, H. E. Farrell, W. D. Rawlinson, R. M. Stenberg, A. E. Campbell. 1999. Transcriptional analysis of the murine cytomegalovirus HindIII-I region: identification of a novel immediate-early gene region. Virology 260: 156-164. Hanson, L. K., J. S. Slater, Z. Karabekian, G. Ciocco-Schmitt, A. E. Campbell. 2001. Products of US22 genes M140 and M141 confer efficient replication of murine cytomegalovirus in macrophages and spleen. J. Virol. 75: 6292-6302. Hanson, L. K., J. S. Slater, Z. Karabekian, H. W. Virgin 4th, C. A. Biron, M. C. Ruzek, N. van Rooijen, R. P. Ciavarra, R. M. Stenberg, A. E. Campbell. 1999. Replication of murine cytomegalovirus in differentiated macrophages as a determinant of viral pathogenesis. J. Virol. 73: 5970-5980. Karabekian, Z., L. K. Hanson, J. S. Slater, N. K. Krishna, L. L. Bolin, J. A. Kerry, A. E. Campbell. 2005. Complex formation among murine cytomegalovirus US22 proteins encoded by genes M139, M140, and M141. J. Virol. 79: 3525-3535. Holtappels, R., D. Thomas, J. Podlech, M. J. Reddehase. 2002. Two antigenic peptides from genes m123 and m164 of murine cytomegalovirus quantitatively dominate CD8 T-cell memory in the H-2d haplotype. J. Virol. 76: 151-164. Pahl-Seibert, M. F., M. Juelch, J. Podlech, D. Thomas, P. Deegen, M. J. Reddehase, R. Holtappels. 2005. Highly protective in vivo function of cytomegalovirus IE1 epitope-specific memory CD8 T cells purified by T-cell receptor-based cell sorting. J. Virol. 79: 5400-5413.